Potato salad does not have to be weighed down with a heavy mayonnaise dressing. By adding in beans for extra body and tossing it all in a simple vinaigrette dressing, this fresh twist on a classic will keep you feeling light as a feather! 1. Place the potatoes into a large pot with cold salted water, enough to just cover the potatoes. Bring the pot to a boil, then reduce heat to a simmer until the potatoes are fork tender (about 6-8 minutes). Drain and return them to the warm pot. 2. In a large bowl, whisk together extra virgin olive oil, balsamic vinegar, sugar, salt, and pepper. 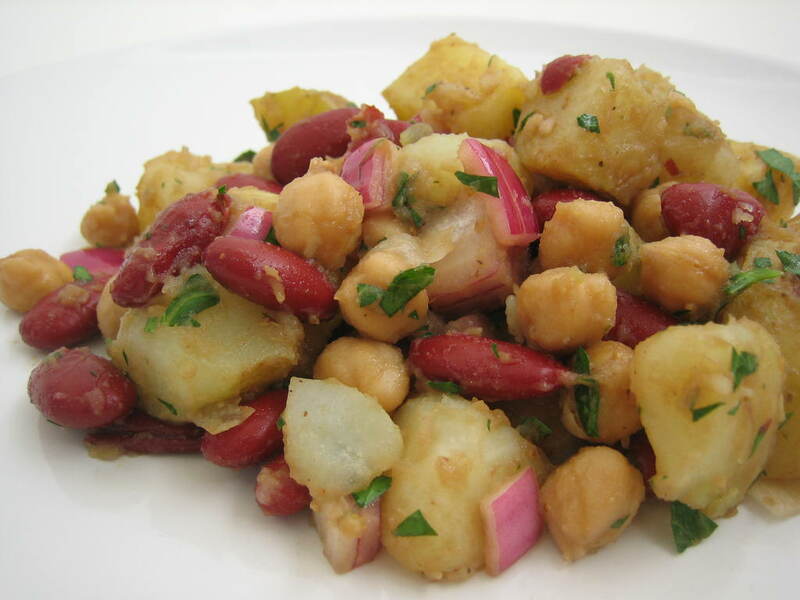 Toss the potatoes, garbanzo beans, kidney beans, and red onion together with the dressing. Allow salad to cool, then mix in the parsley until fully and evenly combined. Season with additional salt and pepper if desired.